Life is not a series of present moments, but a single present moment, with infinite depths. 1. You don’t need all the answers right now. The true guru is within. Right here, right now, in this moment, you don’t have to ‘figure out’ the rest of your life, no matter what anyone says. 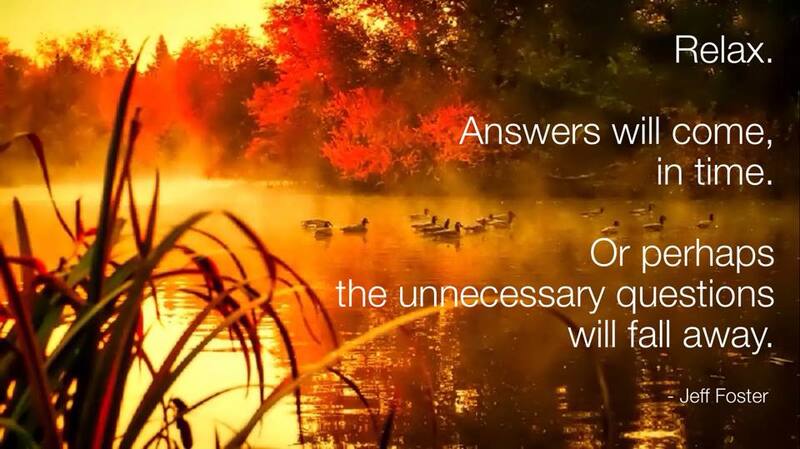 You don’t need all the answers. They will come, in time, or not, or perhaps the unncecessary questions will fall away. There is no rush. Life is not in a hurry. Be like the seasons. Winter is not trying to become summer. Spring does not rush towards autumn. The grass grows at its own pace. The choices that will be made will be made, and you’ve no choice about that. The decisions that will happen will happen, events will unfold, but right now perhaps you don’t need to know the solutions or the outcomes or how best to proceed. Perhaps not knowing is a welcome guest at life’s banquet. Perhaps openness to possibility is a beloved friend. Perhaps even confusion can come to rest here. And so, instead of trying to ‘fix’ our lives, instead of trying to neatly resolve the unresolveable and quickly complete the epic story of a fictitious ‘me’, we simply relax into utter not knowing, unravelling in the warm embrace of mystery, sinking deeply into the moment, savouring it fully, in all its uniqueness and wonder. And then, perhaps without any effort, without any struggle or stress, without ‘you’ being involved at all, the true answers will emerge in their own sweet time. 2. There is nothing wrong with you, and there never was. No matter what they say. Friend, from the very beginning, you were not broken. You were not born into sin. You were not destined for the spiritual garbage heap. There was never anything fundamentally missing from your life. You just thought that there was. Others tried to convince you that you were not good enough, because they too felt not good enough. In your innocence, and with no evidence to the contrary, you believed them. So you spent all those years trying to fix, purify and perfect yourself. You sought power, wealth, fame and even enlightenment to prove your worth as a ‘me’. You compared yourself to other versions of ‘me’, and always felt inferior or superior, and it all became so exhausting, trying to reach those unreachable goals, trying to live up to some image that you didn’t even fully believe in anyway, and you longed for the deep rest of yourself. But you were always perfect, you see, from the very beginning. Perfect in your total imperfection. Your imperfections, your quirks, your flaws, your weirdnesses, your unique and irreplaceable flavours, were what made you so loveable, so human, so real, so relatable. Even in your imperfection, you were always a perfect expression of life, a beloved child of the universe, a complete work of art, unique in all the world and deserving of all the riches of life. It was never about being a perfect ‘me’. It was always about being perfectly Here, perfectly yourself, in all your divine strangeness. 3. Enlightenment is not a destination. And it’s not personal. There is no fixed path to enlightenment. Enlightenment is not a goal, the resting place at the end of a long journey -that’s the mind’s version of enlightenment. Enlightenment is the lighting up of where you are right now. This is very good news. It means that nobody is the authority on your path – no teacher, no guru, no religious leader. It means that nobody can tell you the right ‘way’ for you. It means that you cannot go wrong, even if you think you’ve gone wrong. It means that nothing that happens can ever lead you off the path, for the path is whatever happens, without exception. Nothing can take you away from the miracle of life, or bring you closer to it for that matter, since the miracle is all around, already shining brightly, as every thought, sensation, image, feeling, smell, sound, and as the deeper miracle of the one who is aware of all of this. Be the awareness, shining on the moment, whatever its contents. Doubt, fear, sadness, anger, intense confusion – maybe, just maybe, these are neither enemies nor blocks to enlightenment, but expressions of a deeper intelligence, the same incomprehensibly vast and awake intelligence that gives birth to stars and moves the ocean tides and sends each and every living thing off on its paradoxical journey towards its own being. Come out of the story of time and space and progress towards a future goal, and trust a sacred moment. Take any moment. Any moment at all. This moment. For any moment is the access point. There are never any blocks – only access points. You are not some separate entity on a long journey towards a future completion. 4. Your life cannot go wrong. Even when it seems to go wrong. In reality, your world is set up so that nothing happens to you, but everything happens for you – for your awakening, for your growth, for your inspiration, for your exploration – even if you forget that, or sometimes cannot see it, or sometimes fall into distraction and despair. When there is no fixed destination, you cannot ever lose your destination, so you cannot ever lose your path, so nothing that happens in your life can take you off your path. Your path IS what happens, and what happens IS your path. There is no other. Everything is a gift on this unbreakable path that you call your life – the laughter, the tears, the times of great sorrow, the experiences of profound loss, the pain, the confusion, the times you believe you’ll never make it, even the overwhelming heartbreak of love – even if you forget that sometimes, or cannot see that sometimes, or lose faith absolutely in the entire show sometimes. But even the loss of faith in the show is part of the show, and even the scene where ‘something goes wrong’ is not indicative of the show going wrong, and so you are always exactly where you need to be, believe it or not, even if you are not. Life can be trusted absolutely, even when trust seems a million light-years away, and life cannot go wrong, for all is life, and life is all. Understand this, know it in your heart, and spirituality is profoundly simple, as simple as breathing, as natural as gazing up at the stars at night and falling into silent wonder. The universe is more beautiful than you could ever imagine.